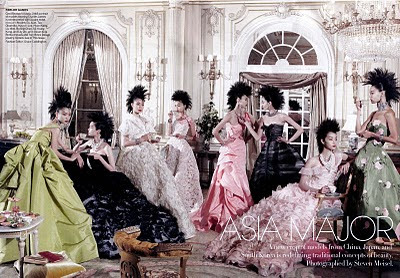 Asian models are not a common occurence in US Vogue. We rarely see them in major editorials, let alone a cover. 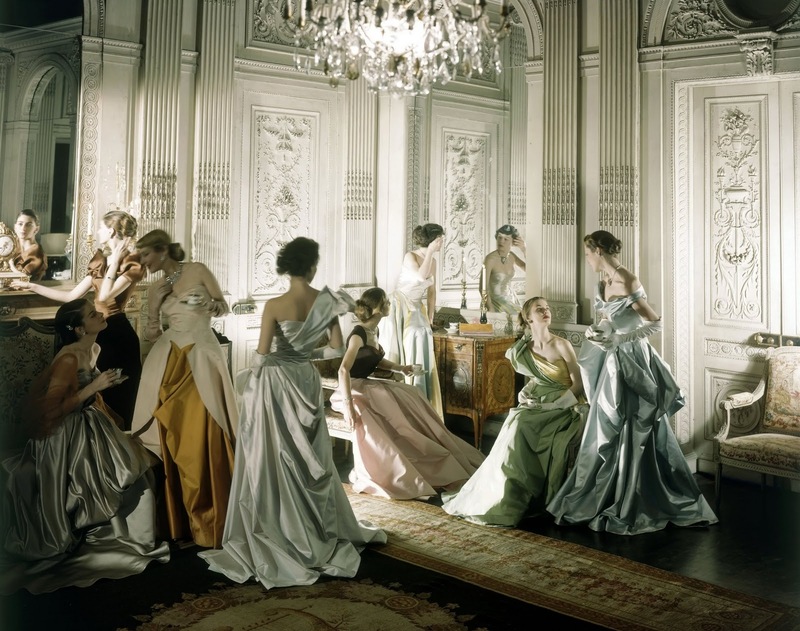 Yet the trend of more and more Asian beauties making their catwalk runs for many major fashion houses forced the magazine to dedicate a whole article to them, with Steven Meisel mimicking the famous Cecil Beaton photograph of Charles James gowns, this time using only Asian models and Oscar De La Renta being the couturier of choice. The result is breathtaking, the models looking gorgeous despite the (unnecessary for me) faux Mohawks (American fashion editors still think a punk hairdo makes a layout edgy). I would have preferred having Julien d'Ys do some of his incredible pile ups on these girls. Or Thanos Samaras for that matter. Check the original photo below. Meisel may be very skilled but he missed the atmosphere completely, going instead for a very flat lighting. Gone are the masterful chiaroscuro effects and sculptural details of the Beaton shoot. Pity. Beaton created a sense of depth totally missing in the modern version. The room is turned on an angle which repeats in the rug and the high ceilings and mirror are key in addition to the varied light on the architectural features. I do love the fashions of the Asia Major piece but you nailed the missing factors completely. In fact, the more I look at the Meisel, the more I wonder why the background is lit up like that. It's very distracting. The Asian women are alone - that's the sense I get. They may all be in the same room but only 2 are actually interacting. In the Beaton, the woman with her back to the viewer is us looking into the scene and the rest of the women are interacting with someone even if it is their own reflection. It's truly a brilliantly composed and lit photograph. I would love to have a big copy of it.